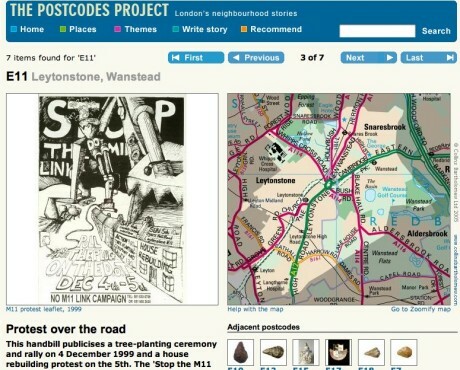 Postcodes is a website published by the Museum of London which enables Londoners to learn about historic objects found in their own 'postcode' neighbourhood. The project covers every area of the capital, from Streatham to the Strand, Chinatown to Chingford, and features objects from the Museum of London's collections. A searchable map provides access to whichever area of London you want to explore. A single page for each postcode area includes a featured museum object and links to local places of interest. Items include Roman coffins from Clapton, fetters found in Finchley and even ships that sailed from Shadwell. The objects can also be searched by topics like politics, transport or fashion, or by era - from prehistory right up to the present day. Visitors to the site can share their stories, memories and photographs, using the Index+ StoryTeller facility, and these are published on the site. Local history groups and black history projects are being encouraged to contribute to the website. The website demonstrates the breadth of London's history and aims to encourage people to get involved in local history and events.